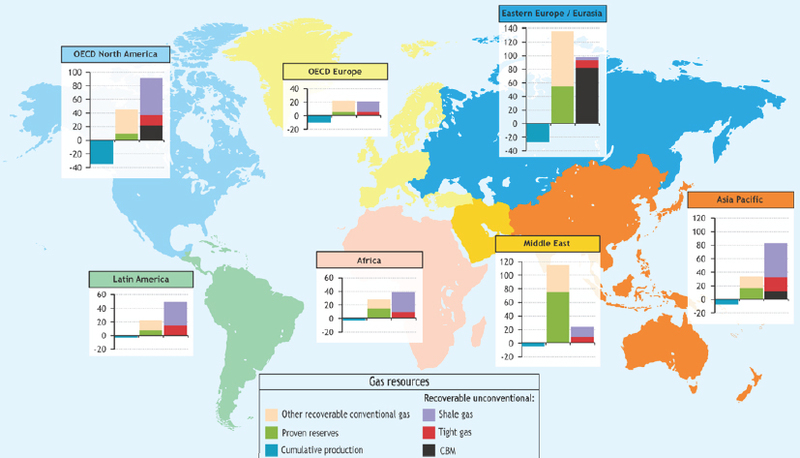 The IEA (International Energy Agency) assessment covers 48 shale gas basins in 32 countries and puts technically recoverable shale gas resources in those countries and in the United States at 187 thousand cubic metres; China has the biggest resources (36 thousand cubic metres), followed by the United States (24 thousand cubic metres), Argentina (22 thousand cubic metres) and Mexico (19 thousand cubic metres). Eastern Europe/Eurasia have the largest known natural gas resources, which are concentrated in the countries of the former Soviet Union. The Middle East benefits from large volumes of gas associated with oil. Total recoverable resources are well distributed geographically, but more than half of the world’s proven reserves are concentrated in Russia, Iran and Qatar in large conventional gas fields. North America and Europe are at the lower end of proven reserves, even though North American reserves have benefited from substantial additions of unconventional gas. Unconventional gas now accounts for nearly one-quarter of total North American proven gas reserves.